The PE&RC Day 2015 will view anthropogenic waste through the lens of an ecosystem, presenting innovative ways of managing waste through recycling or upcycling – making waste more valuable than the original product. Human activity produces massive amounts of waste; everything we consume has been produced along with by-products that enter the environment. But what is waste? In nature, the one’s trash is the other’s treasure. The natural world provides many examples where waste from one species is food for other species. If the waste of one organism is a resource for another, does ‘waste’ truly exist? 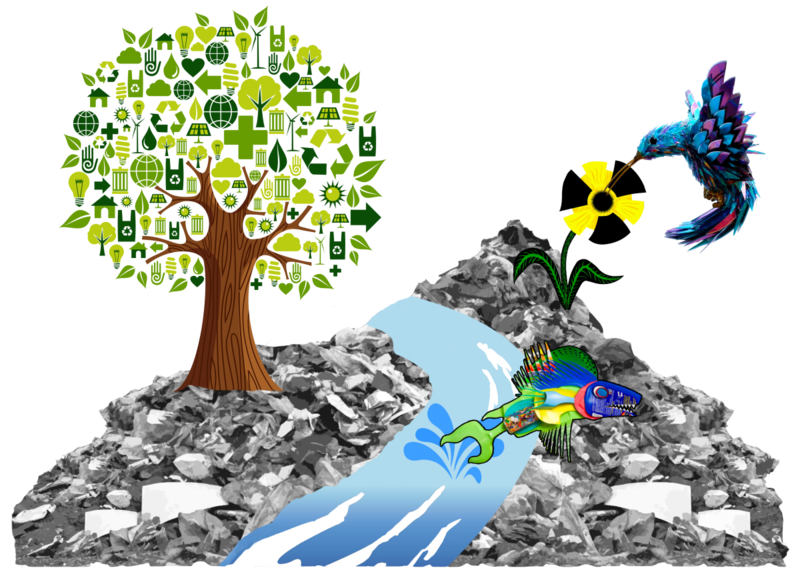 During this day we will focus on some of the major waste streams that we have created and what the consequences of waste are for sustainability of systems. Then we address innovative ways to reduce waste production as well as dealing with waste. A central element will be: can we learn from the ways nature deals with waste; can these “natural” principles be used to counter the build-up of our waste? We hope that the day will appeal to a broad audience. You are cordially invited. This year, we will again award three prizes for the best PhD publications of PE&RC members. For more information about the prizes, the application criteria and the reviewing procedure, please click here. The deadline for submission of your paper was 15 September 2015, and thus the call for applications is now closed. 09:45 - 10:30 What a ‘waste’! Let’s learn from nature! Waste? It is not in nature’s dictionary, nor part of nature’s economy. In nature waste is food, cycles are closed. How different is our human destructive ‘take-make-waste’ economy. Doable with a limited number of people but with 7- and growing to 9-billion people living on this single planet we can no longer run away from the mess we are making. And resources are running out. But luckily we start to realize: destruction of biodiversity and ecosystems is a design problem. Let’s learn from nature and make use of 3.8 billion years of successful natural design to turn our linear economy into a circular one! A challenge for the new generation of ecologists to lead the way! Our future urban homes are expected to be driven by smart technology, but a sustainable lifestyle requires more than just sensors and solar panels. The design of our homes and the devices within might be influenced by unusual materials and organisms. Livin Studio´s projects, like an insect breeding device and a plastic digesting prototype amongst others, have stirred up ideas on how an interface between nature, technology and people could look like. What is considered waste today might be considered food tomorrow, if the interaction with the resource and the tools used for this are thoroughly designed. Can you imagine having bugs in your home or growing food on your plastic scraps? As certain design guidelines are followed, people become more comfortable with the implementation of such products in their homes that will ultimately reduce costs and environmental impact and improve living quality. Urban spaces require a diversity of approaches, from food production to utilizing waste materials. Katharina Unger points out compelling ideas and innovations that lead the way towards a sustainable home and give insights into the creative process and strategy. Given increasing energy needs related to global development, and the specter of climate change related to CO2 emissions from fossil fuels, there is an urgent need for large scale energy production that does not involve the production of greenhouse gasses. Nuclear energy is one possible solution that has been embraced by many developing countries. But the accidents at Three Mile Island, Chernobyl and most recently Fukushima, Japan, have demonstrated the vulnerability of this technology to human error, design flaws and natural disasters and these accidents have resulted in enormous health, environmental and economic costs that must be factored into any energy policy that includes nuclear as an option. Professor Mousseau, director of USC’s Chernobyl + Fukushima Research Initiative, will discuss his studies of plants and animals living in Chernobyl and Fukushima. Extensive research on birds, insects, rodents and trees has demonstrated significant injury to individuals, species and ecosystem functioning related to radiation exposure that had previously been overlooked. He will present an overview of the effects of radiation on DNA, birth defects, infertility, cancer, and longevity, and its consequences for the health and long-term prospects of wildlife living in radioactive regions of the world. Upcycling is creative re-use of discarded materials which results in an increase in value. It has the potential to go beyond ‘zero waste’ and ‘closed loop’ systems to ensure maximum utilisation of resources within long term, local flows, minimizing transport, energy and reprocessing requirements. Industrialisation, mass production, globalisation, and digital technology have resulted in a disconnect between materials, people and places. Upcycling has the potential to empower people to value materials previously considered to be ‘waste’, and reconnect them with materials, design and making. While circular material flows are a laudable goal, the rate of circulation and the benefits of slowing product cycles is rarely considered. The concept of materials ‘ageing gracefully’ is presented as part of a strategy which acknowledges that different products and components have different optimal lifetimes, and that forming an emotional connection between a person and an object provides potential to extend product life and influence attitudes to maintenance, repair and replacement. PHA is a storage polymer accumulated by many different bacteria as an energy reserve similar to fat storage by animals. To produce PHA from organic waste, we use a natural microbial community instead of a specific (genetically modified) microorganism. The microbial community is grown in a highly selective environment to enrich it with PHA-producing bacteria. The advantage of this approach, microbial community engineering, over traditional biotechnology is that the need for sterile conditions is eliminated. This reduces the costs significantly, since it reduces the energy costs and requirements for the reactor, and enables the use of waste as a substrate. The annual PE&RC Day is organised by the PE&RC PhD Council (PPC), with the assistance of Claudius van de Vijver and Lennart Suselbeek (PE&RC). The PPC is composed of the following members: Chantal Vogels (chair), Mark Sterken, Claudio Valero Jimenez, Christina May, Amber Heijboer (UU Representative), Masha van der Sande, Janna Barel, Jasper Wubs (NIOO representative), Paolo di Lonardo (NIOO representative), Maria Pereira, Michael Schultz, Natalie Oram, Sarah Carter, Paul Hoekstra (Naturalis representative), Giel Goertz, Jelle Treep (UU representative), Katharina Jovic, and Anneloes Groenenboom.